Grants and projects using resources provided by UK Research Computing. Computer Science, the Laboratory for Advanced Networking, and the UK Center for Computational Sciences, provides software-defined network (SDN) infrastructure and control to UK researchers and affiliates. The project not only upgrades network components, it also provides a programmable network infrastructure tailored to the needs of researchers. Separation of UK research traffic from administrative and academic traffic enables research traffic to avoid the institutional policy constraints currently placed on all traffic. The resulting SDN network will have a lasting impact on research projects spanning a wide range of areas including astrophysics, bio-medical, computer vision, visualization, and networking research. The most obvious improvement will be enhanced capacity for data-intensive research applications, with transmission speeds of up to 10 Gbps at the research access layer, 10 Gbps from the distribution layer to the UK research core, and 10+ Gbps from the research core to Internet2 and the regional networks (KyRON and KPEN). In addition, system administrators will be able to apply fine-grained control and prioritization of traffic across the campus backbone. It will also enable end-to-end user-defined provisioning of network access and capacity so that each research project can obtain precisely the performance it requires of the network. Finally, being integrated with the GENI network will enable researchers to access additional resources all across the GENI network. -Bypass existing firewalls, distributions, and edge devices. -Deployment of 40/100G Research network SDN routing core. The Kentucky Regional Optical Network I2 peering has been updated to 100G in Louisville. The GENI monitoring alerts system is based on the detection of events based on metric data that polled from remote systems. Raw data is published to a queueing system, which allows multiple complex event queries to operate on the same data stream in parallel. Output of complex queries can generate Nagios alerts, log results to a database, or both. As part of the polling process raw data is both recorded in a database and pushed to a queue. The queue serves as a fanout interface for a one-to-many raw metric subscription service. In the previous figure P represents our polling agent, which publishes data to a queue exchange represented by X. Clients, designated as C1 and C2, subscribe to exchanges by binding their own queues to exchanges. In the example, data published by P is replicated by X to client queues amq.gen-RQ6.. for client C1 and amq.gen-As8… for client C2. The publish/subscribe queuing system allows streams of raw metric data to be replicated between many processes in parallel. This allows us to instantiate one or more complex event processing engines CEPE per replicated data stream and one or more queries inside of each CEPE. We make use of the Esper http://www.espertech.com/ CEPE. Esper allows us to analyze large volumes of incoming messages or events, regardless of whether incoming messages are historical or real-time in nature. Esper filters and analyzes events in various ways, and respond to conditions of interest. An example of the Esper CEPE architecture is shown in the figure below. Simply, CEPE queries are pattern-based (matching) subscriptions describing a possible future event. If the described event occurs, a described output is emitted from the CEPE. There exist a stream of events named MyEvent. In a 3 minute window, if somefield = 10 five or more times, emit data. Just as traditional relational databases, and their related SQL queries, use specific data type operations based on column data types, data streams processed by Esper are defined by strongly typed object classes. In the previous EPL query the somefield field would have to defined as a numeric time in order for mathematical comparison to work. Note how the following data types are used in the example queries. In addition to Alert Queries there are Report Queries. Report Queries do not provide external alerting, but don’t require a specific output format. The output of a Report Query will be stored in a database, which is accessible from the Monitoring site. 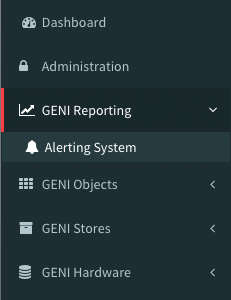 Click on the Alerting System under the GENI Reporting tab, as shown in the figure below. On the Alert page click on Build New Alert on the top right of the screen, shown in the figure below. You are now in the stream query builder page, shown in the figure below. On the stream query builder page, click on Query Node under Add Alert Node, shown in the figure below. In the query node fill in the Query Name and Query String fields. The query name field should describe your query and the query string should be a valid EPL query, which uses the LogTick class. 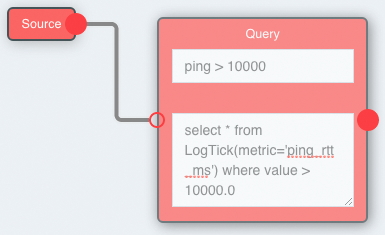 Click on the left edge of your query node and connect your query node to the source node. The source node is the source of LogTick events, based on raw polling metrics. An example query is shown in the figure below. You must now provide a destination for the query output. 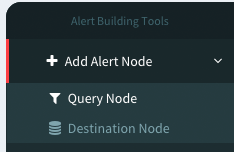 On the stream query builder page, click on Destination Node under Add Alert Node, shown in the figure below. 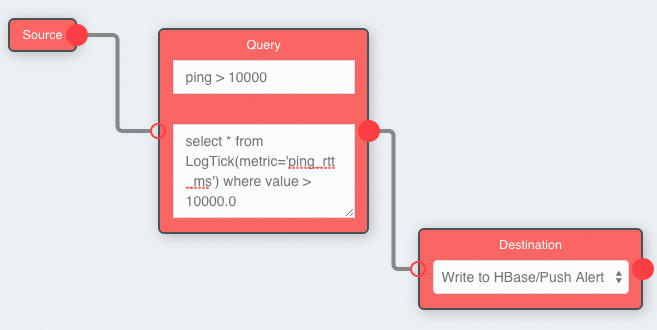 Using the dropdown box on your destination node select your query destination, then connect your destination node to your query node, much how you connected your query node to your source node. 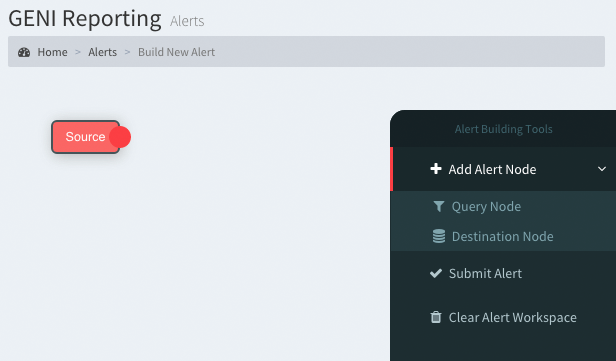 Once a source, query and destination have been configured, as shown in the figure below, click on Submit Alert on the Alert Building Tools toolbar.